We’d love your help. Let us know what’s wrong with this preview of Lost and Found by Sharon Ledwith. 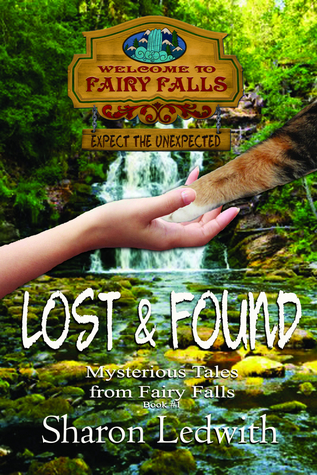 Lost and Found, the first in Sharon Ledwith's Mysterious Tales from Fairy Falls, is the tale of a wise old calico shelter cat named Whiskey and a rebellious teen named Meagan Walsh, who team up to save the Fairy Falls Animal Shelter and the animals who live there, while learning their true purpose. When Whiskey learns that the shelter is in trouble, she becomes determined to find a human to communicate with. Meagan has always been able to talk to animals, but kept it hidden from everyone but her Lost and Found, the first in Sharon Ledwith's Mysterious Tales from Fairy Falls, is the tale of a wise old calico shelter cat named Whiskey and a rebellious teen named Meagan Walsh, who team up to save the Fairy Falls Animal Shelter and the animals who live there, while learning their true purpose. When Whiskey learns that the shelter is in trouble, she becomes determined to find a human to communicate with. Meagan has always been able to talk to animals, but kept it hidden from everyone but her late mother. When she is "forced" to work at the animal shelter, and learns what's happening to the animals, Meagan reluctantly becomes a "pack leader" to help solve the mystery of who might be sabotaging the shelter. Disclosure: I purchased a signed copy of the book “Lost and Found – Mysterious Tales from Fairy Falls” by Sharon Ledwith at a craft show. I have met the author and have had encounters with her on various occasions. We reside in the same area, and are both active in many book related events and activities. I had no communication with Ms. Ledwith at any time about providing a review. The comments that follow are my own personal opinion. I received NO compensation of any kind, or from any one, to p Disclosure: I purchased a signed copy of the book “Lost and Found – Mysterious Tales from Fairy Falls” by Sharon Ledwith at a craft show. I have met the author and have had encounters with her on various occasions. We reside in the same area, and are both active in many book related events and activities. I had no communication with Ms. Ledwith at any time about providing a review. The comments that follow are my own personal opinion. I received NO compensation of any kind, or from any one, to provide this review. I purchased this book, as a gift for a grandson, and read the book to determine its suitability. I do not normally read YA books, and in fact usually avoid them. I found this book to be quite enjoyable and the premise interesting. The animals had wonderful personalities and instincts and the characters were reasonably believable. This is a Young Adult novel and I found much of the plot and character development to be obvious, but I was impressed with the way it kept me reading. The pace was a little off in some sections and some of the faster paced conflicts came off contrived and not completely believable. Overall I enjoyed this book and I’m quite sure my grandson will also enjoy it. This is the first in a new series and if he found it as entertaining as I did, I have no doubt he will be interested in the next story. The animals in the shelter are surprised to learn that Meagan ca Meagan Walsh has just been sent to live with her Aunt Izzy in Fairy Falls, leaving behind her father, friends, and everything she’s known. It wouldn’t be so bad except Fairy Falls is a pretty dull tourist town. When Meagan gets into trouble, the punishment handed down is 200 hours of community service at the animal shelter where Izzy also works. It’s either she feed animals and scoop their poop or charges be pressed against Meagan. Sharon Ledwith’s “Lost and Found” (the first in her “Mysterious Tales from Fairy Falls” series) is a truly fun mystery for middle-grade and young adult readers (and readers of all ages, honestly). As an author, canine (and feline) massage therapist and all around general animal lover from Ontario, the story suited me to a tee, what with it’s setting in an animal shelter in a small town in northern Ontario! Meagan Walsh is both a typical rebellious teen and atypical girl with special and highly u Sharon Ledwith’s “Lost and Found” (the first in her “Mysterious Tales from Fairy Falls” series) is a truly fun mystery for middle-grade and young adult readers (and readers of all ages, honestly). As an author, canine (and feline) massage therapist and all around general animal lover from Ontario, the story suited me to a tee, what with it’s setting in an animal shelter in a small town in northern Ontario! Meagan Walsh is both a typical rebellious teen and atypical girl with special and highly useful abilities—who wouldn’t want to be able to talk to animals! Whiskey, cat and permanent resident of the shelter, is an engaging and unusual mentor for Meagan. I love the way Sharon presents the animals’ way of thinking. The dogs are very much “dogs” and the cats…well, you get the picture. But each character has his or her own very individual, very strong personality, be they cat, dog or human. This was an enjoyable book suitable for middle grade and up that combines magic with animals and several mysteries. It felt a bit rushed at times and a bit over-done at times but was fun and well-written over-all. And the characters, especially the non-human ones, were a lot of fun!